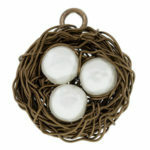 Create a bird’s nest pendant with Perthea Brown on NJ Makers Day. No experience needed, materials will be provided. Priority for this program is for Scotch Plains and Fanwood adult and young adult cardholders. Space is limited, registration is required.